In this intriguing, uplifting holiday mystery from bestselling author Anne Perry, an orphan boy investigates a woman’s kidnapping–and discovers there’s more at stake than a disappearance. It wouldn’t quite be Christmas without a holiday mystery decorated with all the Victorian trimmings as only New York Times bestselling author Anne Perry can render it. Now the tradition continues as mayhem is once again found under the mistletoe, and intrigue stalks the cobblestone streets and gaslit parlors of old London Town. Formerly a river urchin living on the banks of the Thames, nine-year-old Worm has never experienced a family Christmas. But thanks to a job at Hester Monk’s clinic in Portpool Lane, he’s found a makeshift family in kindly Miss Claudine Burroughs and curmudgeonly old bookkeeper Squeaky Robinson. When Worm witnesses the abduction of a beautiful woman by a pair of ruffians just days before Christmas, he frantically turns to Squeaky for help. A one-time brothel owner, Squeaky knows the perils of interfering in nasty business, but he can’t bear to disappoint Worm–or leave the boy to attempt a rescue on his own. What neither of the would-be saviors expects, however, is that the damsel in distress already has her dilemma well in hand . . . and is taking steps to bring her captors to justice for crimes far worse than kidnapping. But the rogues, as cunning as they are deadly, are not to be underestimated. The aid of cynical old Squeaky and hopeful young Worm just might make the difference between a merry triumph over evil and a terrible yuletide tragedy. Note: I received a free copy of this book from NetGalley, and voluntarily read and reviewed it. 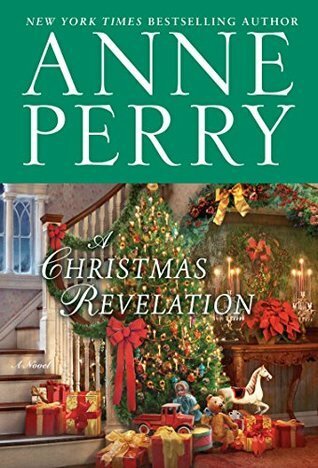 A Christmas Revelation is the 16th in Anne Perry’s series of Christmas mystery novellas. The book is loosely connected to her Victorian historical mystery series, but you do not need to have read them to understand the story. Some of the characters and locations will be familiar to you if you have, though. This is a heartwarming holiday story surrounded by an intriguing mystery. The young boy, Worm, at the center of the tale is such a sweet character. He’s determined to help a young woman that he believes to be in trouble, even after she insists that she is fine. I enjoyed reading about the old-fashioned Christmas traditions, and the details in this story really brought the Victorian age to life. It’s a quick read and is sure to leave you with a smile on your face. Next > Tandem Demise by Duffy Brown – Book Blast! Nice review Erika. It is always nice to go back and see how Christmas was celebrated in the past. Throw in a mystery and I would love it. I really enjoyed the combination of historical, holiday, and mystery! Nice review. I love Old Engish settings and of course a mystery is good.